When my recently father passed away, we had to make some end of life decisions that even though I know we made the right ones, I often wondered if he thought we made the right ones. A very good friend of mine highly recommended Joan to help me, not really being a real believer in holistic healing and mediumship, but trusting in my friend I decided to ask Joan if she could contact my father. I think she was shocked when I called her as she was aware of my beliefs! After our session I was totally blown away with what she had to say. She was able to communicate with him and told me things that only those who knew him would know. She was also able to tell us events that had happened after his passing. I even had to call my mother (who lives on the east coast) to confirm what she had said. And she was totally right. As a “non believer” I would recommend Joan to anyone. It was truly an amazing experience; in fact when my mother comes to visit she wants to meet with Joan. She gave me peace of mind to know that my dad is doing fine and is in a happy place. I had been involved in healing work for many years and developing my intuitive gifts with intense study and the help of well-known healers and mediums. When I lost my beautiful daughter, Darlena, I craved a deeper connection with her. I went to see a Clairvoyant. Because my feelings were compromised, I needed someone who could sweep aside all of the barriers that prevent contact and at last I was able to interact with her in a way that I wasn’t able to all by myself. Through an impartial vessel, I was able to communicate with Darlena. Of course she gives me lots of signs that she is with me, but in order for specific communication to take place, mediumship is necessary. Without this course of action, I doubt I would have been able to walk through the worst pain anyone could imagine, the lost of their child. What if I told you that your loved ones who have crossed over want to communicate with you as much as you do with them? It’s very true, they do. So often, during healing sessions, my client's loved ones would make themselves known to me. I always reported any messages they shared with me during the visit at the end of the session. My clients were thrilled and often said they felt the presence too. It wasn’t long before clients began to return for the specific purpose of making contact with a friend or family member who had transitioned. It is truly an honor for me to be the conduit for this priceless communication. So often, when someone dies suddenly, the painful feeling of having unfinished business remains. Questions and unfulfilled wishes churn in our head and heart. Did they know I loved them? Is it too late to tell them? Can we still say good-bye? I desperately need to say that I’m sorry. Are they at peace? How do they want me to handle their affairs? It is so rewarding for me when clients receive specific answers to unresolved issues. Even if answers aren’t required and there is only the desire to speak with them and feel their energy, inevitably the session involves tears of joy and discarding the heavy emotion of grief. Sorting through the emotions of grief and loss is a monumental task. Remembering to take the next breath or the next step is no longer automatic. It is hard to watch the world go on as usual when pain weighs so heavy on our hearts. Let me help. One painful night, I asked my beautiful daughter, Darlena, for a very strong sign that she is with me. The next morning, as I was walking down the stairs I glanced out my window and thought I saw a bird. I looked closer, hoping Darlena had sent it as a sign that she had heard me, as she often does. 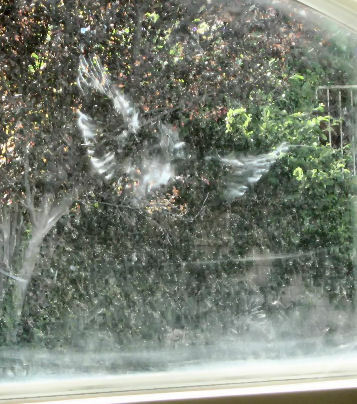 Looking closer, I realized it wasn't a bird at all but an image that looked more like an angel. I stared in disbelief as the image remained. I ran for my camera, peered through the lens and took the picture. When I lowered it, the figure had disappeared. I immediately took the film to Walgreens for developing. I wasn't sure, but I prayed that I had actually captured the astounding image I had seen. I decided to do a little shopping as I waited for my prints. I was at the back of the store when I heard someone exclaim, "Oh My God!" I knew immediately that they saw what I had. Thank you, Darlena for such a beautiful blessing. 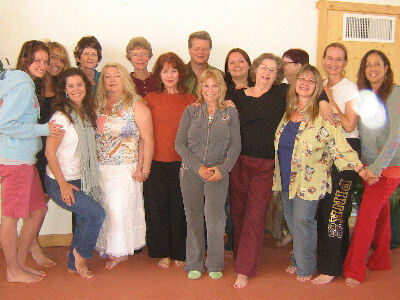 The class photo on the right was taken in Sedona. I knew my Mother and Daughter were with me, but I had no idea how strong until I was sent this picture. 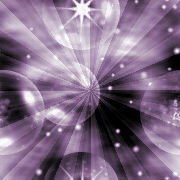 As you can see, they are at my Heart Chakra which makes it even more special! How many people can say they have a picture of their Mother and Daughter from the other side?